This is one of those desserts where you take one bite and want to shout about it’s goodness to everyone near! But only your pup is near! So you tell him even though he can’t have chocolate so he can’t get thaaaaaaaaat excited. It’s one of those tasty treats that you almost eat in the car on your way to give it to someone. It’s the kind you bring into work to share, and eat a quarter of it. It’s that kind. So do me a favor and make this! 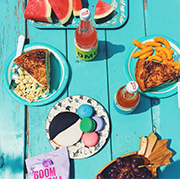 Make minis for easy sharing. Make one big one and bring it to a bbq. Just make it, take a bite, and then tell me if it changes your life as much as it changed mine. Make the crust. Mix the graham cracker crumbs, heavy cream, Nutella, chocolate, and butter together until all of the crumbs are moistened. Press into to the bottom of one large pie pan or 3 mini pie pans. Chill in the fridge until firm, about 30 minutes. Oh my coffee ganache. 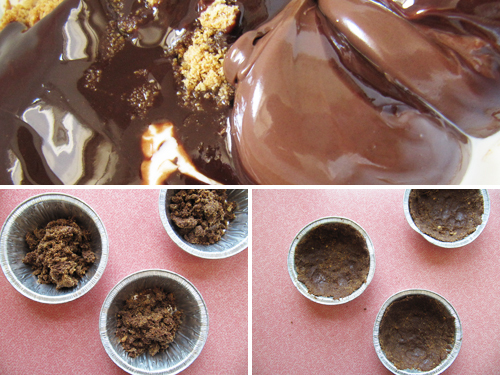 Place the chocolate and butter in a large bowl. Meanwhile heat the heavy cream and coffee along with 2 tablespoons of water until just boiling. Set aside to steep for 5 minutes. Pour through a fine mesh sieve over the chocolate and butter. Discard coffee grounds and whisk until smooth. Pour over chilled crust(s) and refrigerate until set, about 1 hour. Make meringue. Using an electric mixer beat the egg whites on medium speed until light and frothy. Add sugar in 4 additions, beating for 1 minute after each addition. Continue beating until egg whites are stiff and glossy. Spoon over ganache and swirl with a spoon. Toast with a kitchen torch if you want! Cover and chill until time to serve. Pie can be made a day ahead. 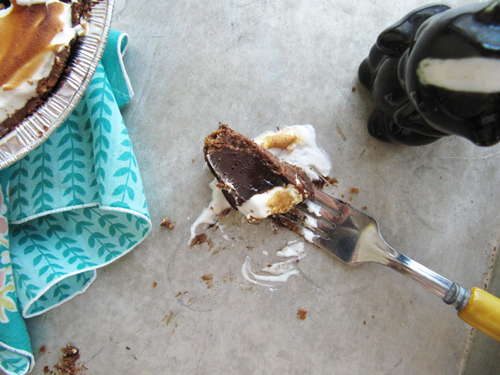 This graham cracker crust has nutella and melted chocolate in it! It doesn’t get too firm when chilled. It stays compact and not even crumbly. Love you and see you oh so soon!! I love that they are individual sizes, or sharing….if you’re into that sort of thing. Sharing or gobbling. NBD either way, right? This has to be in my very near future! 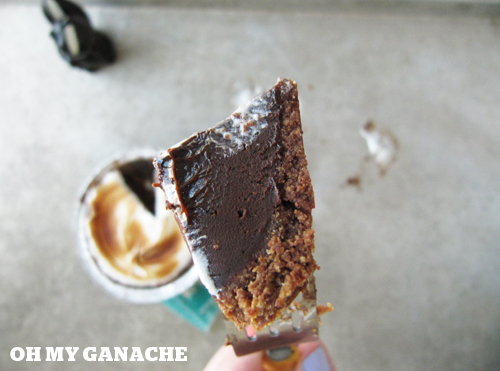 Your OH MY GANACHE pic had me cracking up! I feel like I can almost taste it. ha! yes! I bet you’ll just love it! ah, I am such a sucker for s’mores anything! This looks amazing! Good work! Oh, and I’m probably going to start saying “Oh my ganache!” every day now. how could this not be amazing? thanks for the recipe! ohmygod. I’m almost positive this is happening this weekend. And probably again the following weekend. Oh man. It really should happen weekly! I already am thinking about making it again. Girl, this looks amazing. I know coffee and chocolate are a heavenly match, but throw some fluffy marshmellowy goodness in there and I’m sold. Yeah man! Introducing the coffee ganache into the s’mores goodness is just the best! Ah I saw this in Bon Apetit this month too! I’m making the chocolate semifreddo with Chile-Chocolate sauce this weekend (also on the same page – I was really torn between the two haha). OOh! I want to make that too! Can’t wait to hear how much you love it. OH and PS The fork picture kinda made me drool a little. Meant to mention that too. Yes! That ganache is ridiculous, right?! I saw this recipe in Bon Appetit as well and made it up right away. I mean that photo was so enticing, don’t you agree. 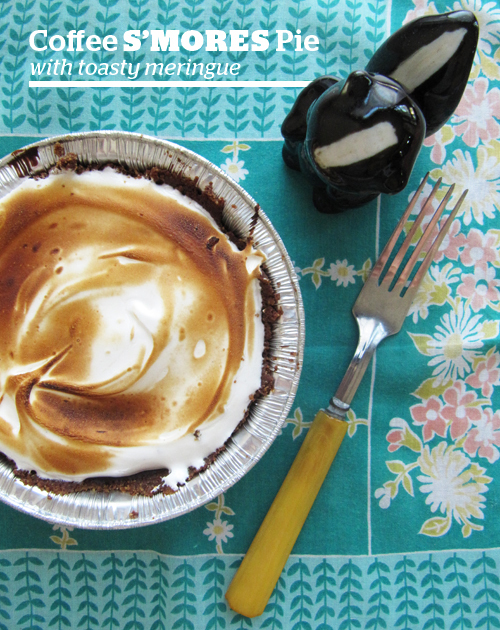 I loved this pie and loved how dark and rich it was, but my kids thought it was a bit too strong in coffee flavor. I am thinking of making it next time sans the coffee. I really did LOVE the crust on this and plan on using it in other recipes instead of just plain old graham cracker. 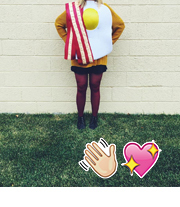 I love how you made mini pies from it and I adore your fun photos! Yes! That photo won me over immediately. And yes! The crust is dreamy! Get outta here! That looks so good I can’t stand it. I must have one. No graham crackers here but we have something similar that will do – almost. Yes! Maureen, you’re going to want to marry this pie! It’s love-worthy! Right?! I’m making it again!